All photos by Ron Goodenow. Reproduction without Ron's permission is prohibited. 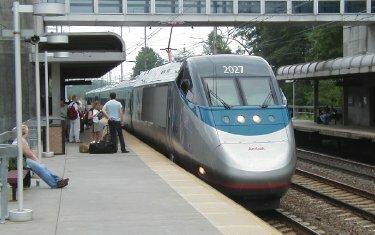 As reported on the Friends of Amtrak site in June, 2001, my travel on the privatized British rail system in May was fraught with late and cancelled trains, broken infrastructure, poor customer service, inaccurate websites, and, even for first class travelers, dirty cars and out-of-service buffets. But the frustration of actually riding the trains was more than made up for by the opportunity to photograph a system that is a quite colorful mix of 'heritage' equipment, monumental stations, and spanking new trains that may be a harbinger of better times ahead. I'll be sharing several photos over the next few weeks. 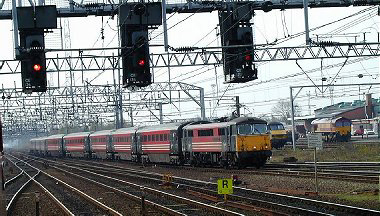 These were taken of Virgin Rail intercity runs in and near Preston on West Coast Main Line between London Euston and Glasgow. Virgin has purchased a fleet of high speed Italian Pendolino trains for the route, which should be going in service any day now. And, yes, Richard Branson's on-board and station services were by far the best I encountered -- perhaps, as a fellow traveler said with bitter irony, because he runs an airline. In today's Britain getting to and from the airport can be done in speedy style, as it can in many parts of Europe. On the left is a Gatwick Express which, on the Brighton intercity line, runs every fifteen minutes during the day, and covers the distance from Gatwick Airport south of London to Victoria Station in 30 minutes. My first class rail pass got me a very comfortable seat, a newspaper and at my seat light food and beverage service. The Heathrow Express runs from Heathrow Airport into Paddington Station every fifteen minutes. Its fifteen minute ride cuts about 45 minutes off the Underground trip. 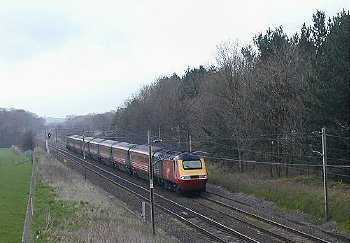 Other major airports, including Manchester, enjoy extensive local and intercity rail service. It boggles the mind to think that our 14 bil plus Boston Big Dig couldn't figure out how to extend service from South Station to Logan Airport (or between North and South Stations), that one can only creak and groan into Chicago from O'Hare, San Francisco is just now setting up a connecting service to the City By the Bay and New York, well, about 20 years ago I remember a dedicated 'plane to the train' service from Midtown to JFK that is long gone. 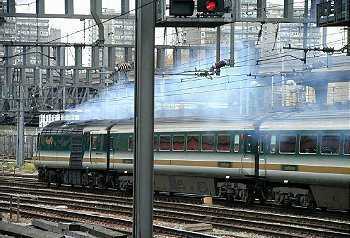 The High Speed Train (HST) or InterCity 125 has been the mainstay of high speed running in the UK since 1976 (see my 1985 photo on page five in the FOA Photo Gallery). Articulated, sleek, able to accelerate and break rapidly, and popular, they now have competition from Italy, thanks to Virgin's investment in electric Pendelinos which will not be running on lines favored by the diesel powered HST's. A highlight of my trip in May 2001 was to be a run from Plymouth to London Paddington on a First Great Western 125 that would traverse the race track between Bristol Temple Meads and London. Alas, the object of my affection broke down in the Plymouth yards, relegating me to a rather beat up and less than squeaky clean conventional trainset that hobbled its way down the line significantly late. Folks who complain about Amtrak should really get a load of Great Western. Squeeze every nickel it can out of the government and weary consumers while letting the equipment and passengers rot all at once. 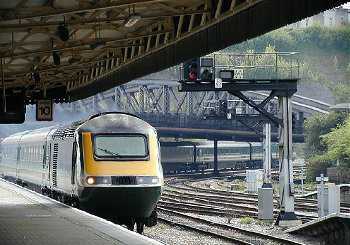 On the left is a GW 125 arriving at Bristol. On the right is the sad sight of another leaving Paddingon, belching fumes and doutbless ready to fall apart somewhere along the way. 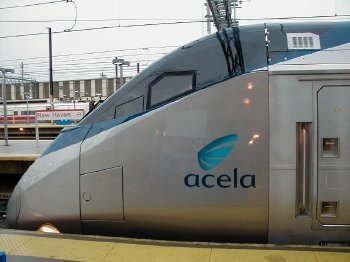 Acela Express, August 10, 2001, photographed at BWI, near Baltimore, where my trip on it originated, and in New Haven, where it ended. High and handsome, thoughtful ergonomics and stunning industrial design, great windows, sometimes smooth as silk -- roadbed permitting. On a day when oppressive heat hobbled Amtrak and thunderstorm stranded thousands of airline passengers, we were full and only 35 minutes late into New Haven. But the devil is in the Amtrak customer service details, and these details give one pause. Restrooms at packed BWI station inscrutably closed to long lines for twenty minutes, schedule monitors utterly inaccurate. Coach seat, which they call 'business class' (minus the free drink and newspapers offered in conventional business class), overpriced at $138, a web site that wouldn't let me make a reservation, twenty minutes to get a cup of coffee in the forty minute late opening café car that was out of several food items upon departure from Washington and closed over the dinner hour between New York and New Haven. Audio channels with nothing on them and a mistaken public address annoucement in New York, "This is the Northeast Direct Service to Boston." As we watched traffic on the Connecticut Turnpike wiz by, the guy across from me who desperately wanted a cold drink and would have to wait another hour said "we coulda taken the bus." I wouldn't, but next time he might. My trip to Washington the day before on conventional equipment was about half the price, pretty close to schedule and the cafe car was open and fully stocked all the way. Go figure. Changes last made on: July 1, 2002.